We have some beautifully coloured B/W ESS, They have wonderful playful natures that love to be cuddled and played with all day long. They are from great breeding lines and would make brilliant working or pet puppies for any household. 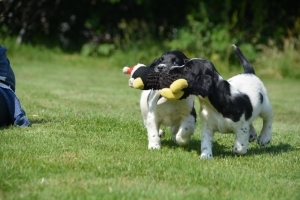 These puppies have excitable behaviours and loved to be fussed, and have started to show beautiful retrieval instincts and are not phased by anything. 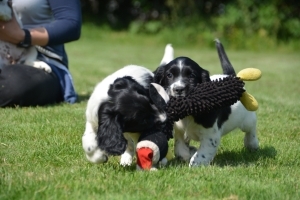 These puppies will leave us with 4 weeks Pet Plan Insurance, a comprehensive puppy training guide, micro chip registered to the new owner and their pedigree. 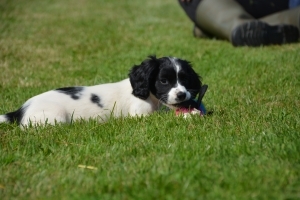 We have many 30 years experience of breeding and training gun dogs and we pride ourselves on empowering our new puppy owners with the confidence to integrate and train your new family member. Please try entering https://graph.facebook.com/132194283611161/photos?fields=source,link,name,images,album&limit=4 into your URL bar and seeing if the page loads.Facebook API came back with a faulty result. You may be accessing an album you do not have permissions to access.